One of the fun electronics projects that one can experiment and build are projects that use lights. Among the lighting devices that are popular in recent years are LEDs (Light Emitting Diodes). LED is fast replacing bulbs as the technology in LED gain break though year by year. The luminence of powerful LEDs and the development of various colors of LEDs - in recent years, blue colour has become a common color. LEDs have been used in household appliances, automobile, control circuitry and a host of other applications. Other project include the use of triac as phase control for light dimmers. Here are some of the projects that you can build. Build this simple LED Circuit that provides 10-15 seconds of light before it turns off automatically. Try this circuit that uses a LDR and Op-Amp to automatically turn ON a lamp when it is dark and OFF when it is bright. This is a simple LED flasher project that uses a CMOS 74C04 Integrated Circuit to alternately ON and OFF two LEDs that are connected in parallel. 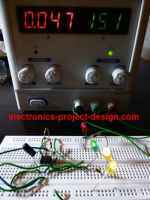 This is another simple LED project that uses a 555 Timer Integrated Circuit to alternately ON and OFF two or more LEDs that are connected to the output of the timer circuit. Try this project that uses only three components besides the need for dry cell batteries. The application note provides the design of a CFL (compact fluorescent lamp) that is able to drive a 13W lamp from 110 or 220 VAC input, 34kHz frequency of operation and softstart with cathode preheating.